A healthy riparian area is a complicated system composed of multiple parts: plants, excellent water quality, healthy soils, fish and other aquatic wildlife. These areas are easily recognized by their green, lush appearance – even when the watershed is flowing through a desert. 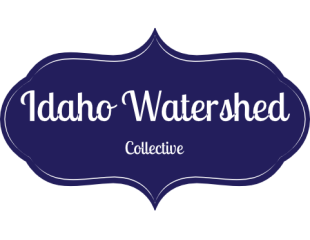 TAKE A LOOK at the text and photos below for an overview of the impact public lands ranching has had on some riparian zones in Idaho. Summit Creek, Custer County, ID. On the left you can see a sure sign of a healthy watershed – a beaver pond! This is also Summit Creek. Note the extremely healthy vegetation and the deep, clear water. Although this creek flows through a forested region, you would see the same lush growth in a desert watershed. The difference is that the band of intense vegetation would be narrower. Summit Creek, Custer County, ID. No grazing. Now compare this to some creeks subjected to years of overgrazing. 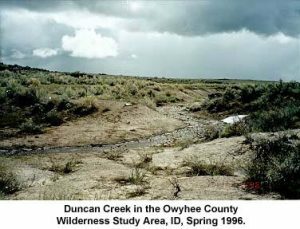 This is Duncan Creek in the Owyhee County Wilderness Study Area, ID. The riparian vegetation has disappeared, and the water is muddy. Signs of soil erosion are clearly evident. This is Mary’s Creek which runs across school endowment land in southern Owyhee County, ID. 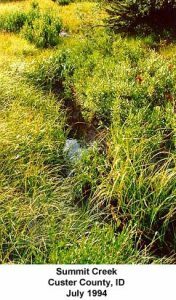 The severe cutbanks and soil erosion are caused by cattle grazing. This is Blue Creek on BLM lands in Owyhee County, ID (taken July 1996). This watershed has been devastated by cows – in fact it has essentially become a cattle wallow! Fish, particularly salmonids, are reduced in numbers, size, and distribution, with populations eventually being eliminated. Water quality degrades from increased turbidity and chemicals (livestock pollutants) leaching through soils. Less or no water is stored within the banks, causing flood damage and reduced late season flows of springs and streams. Note how the wet meadow converts to sage scrub as watershed devastation proceeds! In addition to ruining the vegetation, cattle can cause some severe pollution in watersheds that they impact – and not just as a result of their cow pies! Take a look at this rather shocking photo. 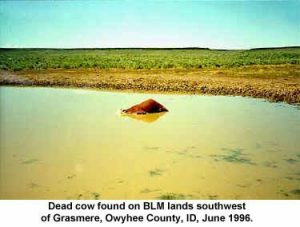 This dead cow was photographed on BLM lands southwest of Grasmere, Owyhee County, ID. We advocate for reversing the devastating effects of overgrazing in riparian areas by putting a stop to grazing in these zones for a period of ten years – during which time nature can begin repairing the damage caused by human mismanagement. When the banks of the stream are stabilized to prevent erosion, nature can begin to repair the watershed! 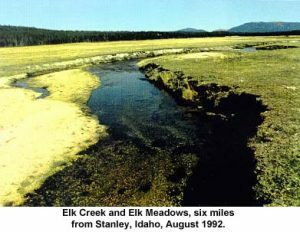 Look at some photographs of nature at work on Elk Creek and Elk Meadows about six miles from Stanley, ID. The riparian area was clearly heavily overgrazed and heavily damaged. Subsequently, the area was closed to grazing and is being allowed to recover. 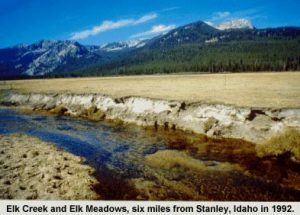 Elk Creek and Elk Meadows, Sawtooth National Recreation Area 6 miles from Stanley, ID. Heavily overgrazed, heavily damaged. From this short exploration of healthy and unhealthy riparian areas it should be apparent that overgrazing is truly destructive and needs to be stopped! Our public lands need time to rest and recover or they will be unable to provide for our future generations. These School Endowment Lands are part of the inheritance of the children of the west – don’t they deserve the best?